Auckland’s Anniversary Day commemorates the arrival of Lieutenant-Governor William Hobson in the Bay of Islands in 1840. Today it is best known for a regatta on Waitematā Harbour, possibly the largest in the world. The first regatta on the harbour – an impromptu three-race affair – was held on 18 September 1840, the day an advance party arrived to found the colony’s new capital. The government chose 29 January as Auckland province’s official Anniversary Day in 1841, and the first regatta was held the following year. The regatta gave way to horse racing at Epsom for the next few years, but was revived in 1850. It became an annual event and has been cancelled only in 1900 during the South African War. 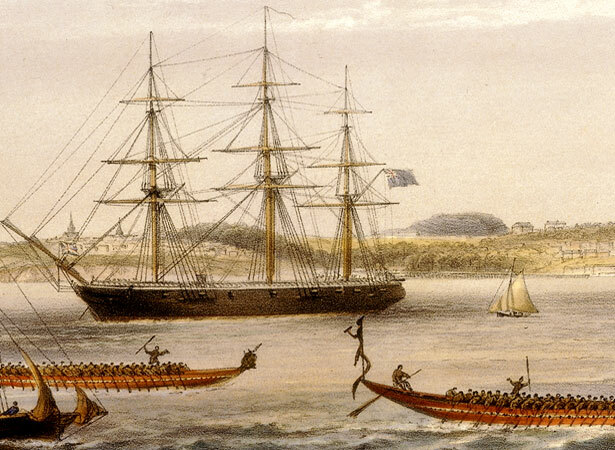 In the early years, races were between ship’s gigs, dinghies, whaleboats and waka. Some of the most exciting racing was between working vessels – fishing boats, centreboard mullet boats, scows. Powerboats raced for the first time in 1903, and seaplanes in 1919. These days there are races for waka, tugboats, dragon boats and radio-controlled (as well as conventional) yachts. We have 3 biographies, 4 articles, related to Auckland's first Anniversary Day Regatta.